« Day 467 In Beijing: Prayer At A Mosque. Day 468 In Beijing: The Grand Bazaar, Part 1. 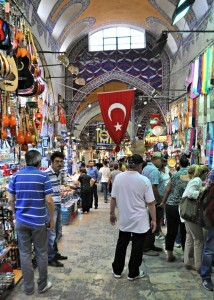 Shops, people and things for sale at The Grand Bazaar. Jill and I both agree that calling it The Grand Bazaar is an understatement. It truly is more than grand. It truly is more than bazaar. In both terms of that word. And, therefore, it is more than just The Grand Bazaar. But, that is what they have chosen to call it, so that is what it shall be called! The Grand Bazaar started around 1455 or 1456. It continued to grow, and become a cover bazaar, through the next 300 or so years. Then, in the 1900s, when the textile production exploded, it had another massive growth spurt and became primarily the bazaar we can visit presently. There have been a number of fires, earthquakes, and other issues, but the Grand Bazaar refuses to die and is a fantastic event to visit if you ever go to Istanbul. One of the amazing sites of the Grand Bazaar are the carved metal display dishes, the furniture for sale, the handcrafted rugs, of course, the incredible jewelry. There is some silver but it is, as you can see in the pictures, primarily gold. It is breathtaking and amazing. The Grand Bazaar shines with a gold tint when you walk near the jewelry area and it is fun just to look at all the different designs and styles of jewelry that are on display.